Rosemary (Rosmarinus officinalis CT cineol) has a fresh, herbaceous, sweet, slightly medicinal aroma. 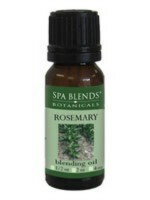 An energizing oil, it may be beneficial for helping to restore mental alertness when experiencing fatigue. * It is also a popular ingredient in skin and hair care products. This oil should be diluted before use.